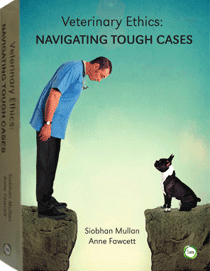 Small Animal Talk: Does your office need canine therapy? Does your office need canine therapy? Remy the therapy dog can visit you at work. Do you get stressed at work? Would the appearance of one, two or five trained therapy dogs take the pressure down? 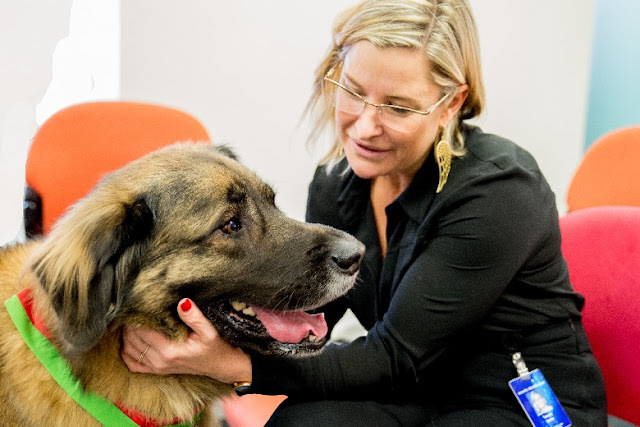 When I attended the trade display at a behaviour conference recently I learned that the Delta Institute have started a program – Paws the Pressure – designed to bring animal assisted therapy into the workplace. Companies and organisations can, for a fee, organise a visit from trained, vaccinated, insured and recently relieved Delta dogs. Since starting last year, Delta dogs have “pawsed” the pressure at companies like ASIC, PwC, DHL, Allens Lawyers, Department of Defence, Goldman Sachs, Apple & AbbVie. We asked them what it was all about. What are the benefits of animals in the workplace? Visits from our therapy dogs assist employee wellbeing, reduce stress and boost staff morale. Staff enjoy the positive interaction, social aspect and change in office mood during a therapy dog visit. Best of all, there’s no mess to clean up after! Dogs like Antar just have a way of making people feel better. Is there a lot of demand and where is most of it coming from? Our Paws the Pressure program was launched in July last year & we have already undertaken 55 visits. 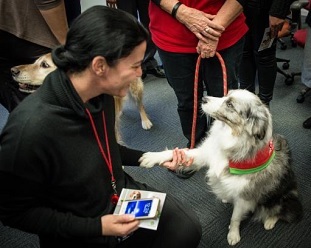 There is an even mix of small, medium and large companies wanting therapy dog visits as part of their employee health and wellbeing program. Also Universities and TAFEs who benefit from therapy dog visits to assist students mental health – particularly during stressful exam time! These visitors make everyone's day. What is the impact on the people who have these visits? We have received such positive, happy feedback from the companies and Universities we have visited. How can people organise this? Very easily – they can apply online and we will contact them to tailor a visit to meet their needs, depending on the availability of our therapy dogs. Most of our 13 branches across Australia can accommodate Paws the Pressure visits. The visits are 90 minutes. All Delta dogs are accompanied by a trained volunteer. The idea of trained dogs in the workplace is a lovely concept. Of course one can always go one better and welcome companion animals into the workplace.